Established 25 years ago, following the fall of communism in Albania, Seventh-day Adventists now own their place of worship in the capital city, Tirana. 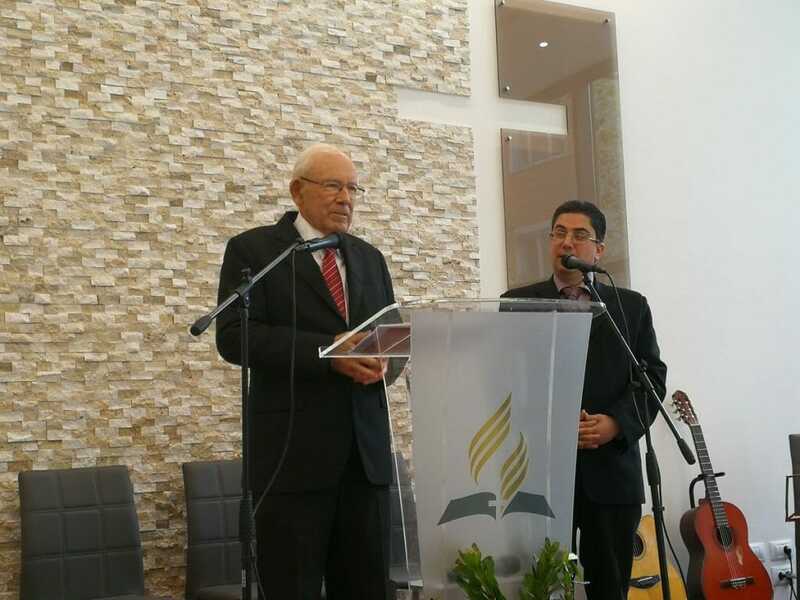 Celebrations on Nov. 11 took on the atmosphere of a festival of faith as president of the Albanian Mission and pastor of the Tirana Central church Leo Espana led a special service involving guests who, over the years, have been part of this story of miracles. The new church, located in downtown Tirana, will reach out to a city of nearly 1 million inhabitants. It is a big dream come true for local members and was made possible thanks to the generosity of fellow Adventist from across the world, as part of their 13th Sabbath Offering, a special mission offering collected four times a year. Special guests on this remarkable day included Julian Kastrati, Tirana Central’s longest-serving pastor, with his wife Beatrice, and David Currie, one of the first evangelists to arrive in Tirana after the fall of communism, and his wife. Even though they now live in Australia, their love for Albania would not let them miss that special moment. Currie nostalgically recounted his experience as an evangelist in those first years after communism. His key memory was meeting Meropi Gjika, the great heroine of the Adventist faith in Albania. The 25th anniversary of Adventism in Albania and Tirana would have sounded meaningless without recalling the faithfulness of this great woman who inspired the first generation of Albanian Adventists. Today she stands as an inspirational symbol of this new beginning, that the Tirana Central Church is hoping to experience with its new church building. In spite of it all, Kastrati called members and guests to remember God’s ongoing presence is real. Trans-European Division church region Stewardship Ministries director David Neal said to be impressed by the story of Gjika, who faithfully kept her tithe in cookie tins under her bed, through the dangerous days of communist rule. Tirana Central church is praying that this new building will bring a new beginning, a spiritual revival of the church itself, fulfilling the great commission of Jesus to spread the gospel, baptize and make disciples across the city. For members, it is a priority in a city that faces increasing secularism. Noting the building floor-to-ceiling windows looking onto the street, Neal said they could provide a witnessing opportunity. “I hope they are always free of blinds and curtains so passersby can see a worshipping community,” he said.